Batiste -- a very soft opaque fabric, plainly woven and lightweight -- most often has fibers of cotton, wool, linen, polyester or a synthetic blend. When batiste is manufactured, it gets no acid wash, so the material is not transparent like voiles or organdy, explains the NY Fashion Center. It has a bit of substance, and may be washed and delicately dried by machine. Treatments for producing batiste include a satin weave to create a very shiny finish, mercerizing that adds more gleam to the threads, combing threads to produce higher quality batiste, and plain weaves using wool or cotton. Imperial batiste is made by blending cotton and polyester. The light fabric can be used for bedding, such as tucked and pleated pillow shams, and non-sheer curtains that let in light while blocking the view. Batiste may be lined, but it is an opaque lightweight, not sheer, fabric. Batiste is featherweight and it breathes, making it comfortable for baby and children's clothing; it smocks beautifully but is sturdy enough to hold up to a little wear and tear. The fabric has a soft sheen, yet it will hold embroidery and is a good choice for decorative samplers. 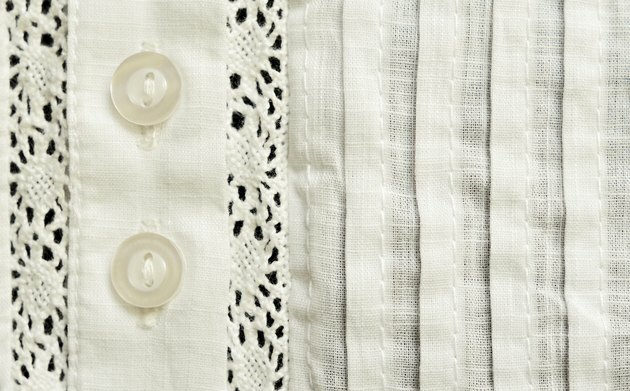 Search for heirloom clothing made from batiste to frame or display in a shadowbox, or to machine-stitch and turn into period doll clothing for an authentic china doll collection. Use it for crib bedding and the ruffles or smocking on a bassinet. A batiste duvet, styled like a pleated and tucked blouse with a closure of tiny pearlized buttons, would be a practical and romantic cover for a feather comforter. What Is Brocade Fabric Used For? What Is the Difference Between Satin & Sateen Sheets?